Toyohara Kunichika (1835-1900) Fifty-four Modern Feelings Matched with Tales of the Genji # 9: Aoi, 1884. Oban. This lovely print is from an 1884 series which parodies one of the famous Japanese romances of the 11th century: Fifty-four Chapters of Genji Monogatari by Murasaki-Shikibu. The novel from which the print derives is not even the original, but a rewritten version which assumed huge popularity in Edo Japan. The Rustic Genji is set later, in the 15th century and Kunichika’s teacher, Kunisada provided the illustrations to it in the 1830‘s. 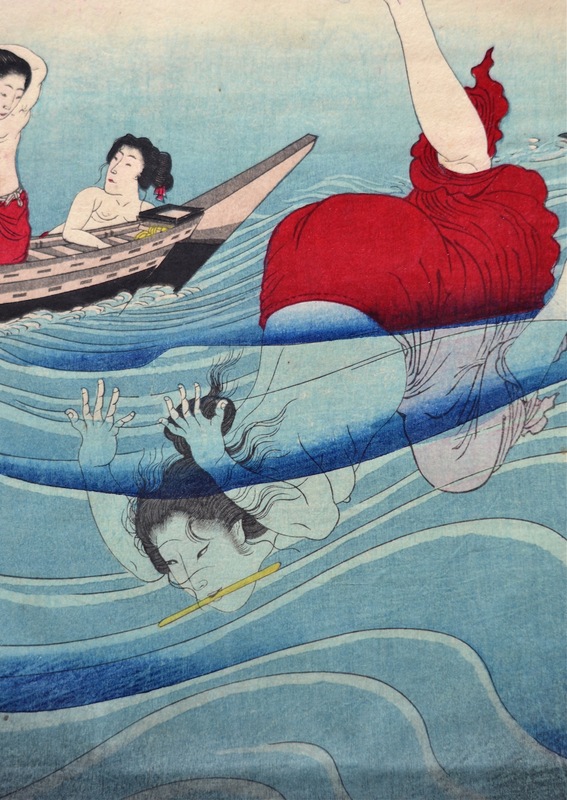 Kunichika acknowledges his debt by quoting the figures of the diving women directly from a Kunisada triptych of 1859. This print (the finest and the most sought after of the series) depicts a group of Ama; female divers collecting abalone off the coast of Ise. By the time Kunichika had produced this series, ‘Genji Fever’ had already spread right across Japan in plays prints and even household objects. The title is a pun on the word Genji; like so much of his work it evokes his continuous conflict between the ancient and modern. In this case Genji can be read in the context of the title as meaning ‘contemporary times’. 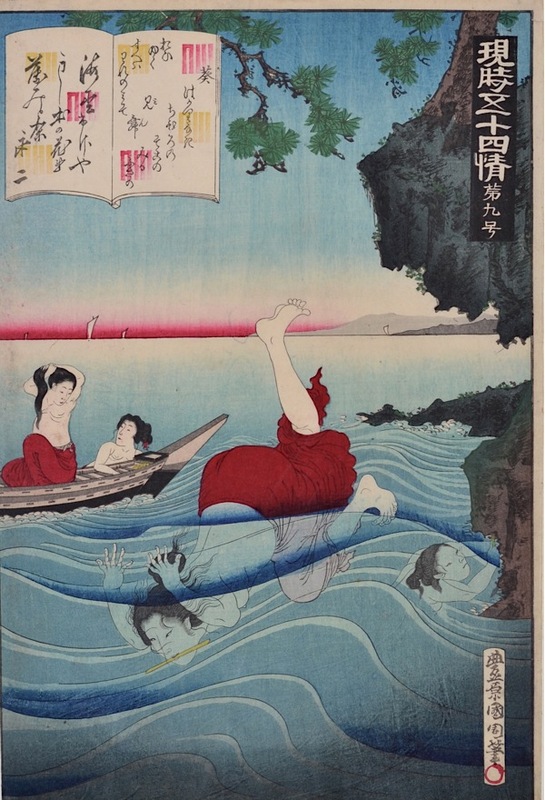 The original poem in this chapter of the Genji compares his future wife, Murasaki no ue, who was twelve at the time, to the potential blooming of seaweed hence the image of the abalone divers. There is very fine and layered bokashi shading throughout the print. A beautiful print, full size but with borders. Fine colour and impression, and condition. The print is illustrated on page 65 of Amy Reigle Newland, Time Past and Time Present, Images of a Forgotten Master, Hotei Publishing 1999.